Pin Up Peach is a medium peachy pink with gold sparkles. Pink Possibilities is a creamy light pink. Packaging: These are standard twist-up lipstick tubes with translucent color-coded lids displaying the product name in a pretty font. The lid feels secure and the lipstick twists up smoothly. Smell/Taste: They have a very light fruity/vanilla fragrance but do not taste like anything. Application: Since these are sheer and lightweight, you can just swipe these directly onto your lips without having to use a brush. They feel moisturizing and gel-like when you first apply them and stay that way for about an hour and then they start to dry out. Pigmentation: These are sheer but yield slightly more color than a tinted lip balm would. They are very similar to the Revlon Lip Butters in terms of color payoff but not as moisturizing. 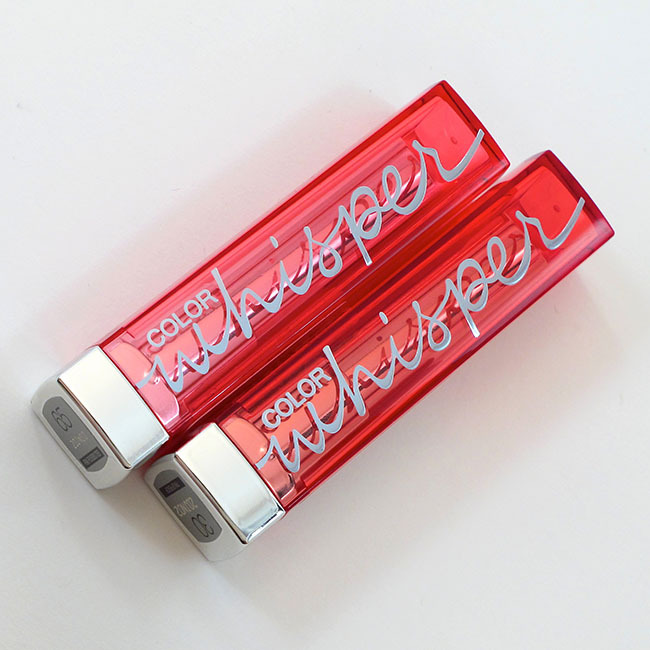 The color will stay on your lips for a short time like a stain after the glossiness fades. Longevity: 2 – 3 hours total. The initial moisture and shine last about an hour. After two hours they start to feel dry and toward three hours the color fades significantly. The color in Pin Up Peach lasted slightly longer than Pink Possibilities but they both dried out after about the same amount of time. Worth buying? These would be good for those who don’t like to wear a whole lot of color on their lips as they offer a subtle, natural look. They would not be good for those who don’t have the time or patience to keep reapplying them though.